With only days to go until the announcement of this year’s Nobel prize winners, the usual speculation of who the most prestigious awards in science will go to is generating buzz once again. Predictions for the chemistry prize range from supercapacitors and metal–organic frameworks (MOFs) to old favourites like lithium–ion batteries. Clarivate Analytics has revealed its 2018 citation laureates based on the most cited papers from its Web of Science database. Clarivate suggests likely winners for the chemistry Nobel are Eric Jacobsen, professor of chemistry at Harvard University, US, for his work on catalytic reactions and the invention of the Jacobsen epoxidation; structural chemist George Sheldrick of the University of Göttingen, Germany, who designed the SHELX computer programme for crystallography; and chemist JoAnne Stubbe from the Massachusetts Institute of Technology, US, for revealing the function and action of ribonuclease reductases. For the physics prize, material scientists Yury Gogotsi, Rodney Ruoff and Patrice Simon have been put forward for their work on carbon-based materials, such as nanotubes, and supercapacitors, which are emerging as rivals to batteries. And keeping with the chemistry theme, the discovery of the spin Hall effect in semiconductors – explaining electron behaviour in magnetic fields – could mean David Awschalom and Arthur Gossard, both in the US, are honoured. American astrophysicist Sandra Faber is tipped for the prize for her contributions to cosmology and understanding of dark matter. As for the Nobel in physiology or medicine, Clarivate has suggested three candidates: bioinformatician Minoru Kanehisa from Japan for developing the Kyoto Encyclopaedia of Genes and Genomes; neuroscientist Solomon Snyder, US, for identifying neurotransmitter receptors; and molecular biologist Napoleone Ferrara from Italy for his discovery of vascular endothelial growth factor. On Twitter, a poll started by Nature Chemistry editor Stuart Cantrill suggests that users are rooting for lithium–ion batteries for this year’s chemistry win, narrowly followed by Crispr and MOFs, all of which have made the shortlist for predictions in previous years. By contrast Stuart Schreiber from Harvard University has come out on top for therapeutic small-molecule probes from votes cast for honorary society Sigma Xi’s blog prediction contest, beating the likes of Jennifer Doudna for Crispr and John Goodenough for the lithium–ion battery. This contradicts last year’s predictions that placed Goodenough and Stephen Lippard, known for his work on bioinorganic chemistry, in the top two places. Everyday Scientist blogger Sam Lord believes chemistry’s top spot should go to biochemist Jim Spudich and cell biologists Ron Vale and Mike Sheetz – the trio were awarded a Lasker Award in 2012 for their work on cytoskeletal motor proteins that power chromosome and membrane movement via microtubules. The annual chemistry Nobel prize prediction webinar run by Chemical & Engineering News has revealed the picks of its scientific panel. University of California, Los Angeles professor of chemistry Neil Garg is hedging his bets on Robert Bergman for C–H activation, and Harvard’s Nicole Gaudelli thinks Christopher T Walsh’s antibiotics work deserves a Nobel nod. Joseph Moran from the University of Strasbourg, France, backs the inventors of the lithium–ion battery. Meanwhile, Jordanian–American chemist Omar Yaghi and Polish polymer chemist Krzysztof Matyjaszewski are emerging as the most popular choices in ChemistryView’s vote for who will win the chemistry Nobel prize. Yaghi for pioneering MOFs and Matyjaszewski for atom transfer radical polymerisation, both of which have widespread applications. Organic chemist Steven Ley and dye-sensitised solar cell developer Michael Grätzel have also appeared in the results. 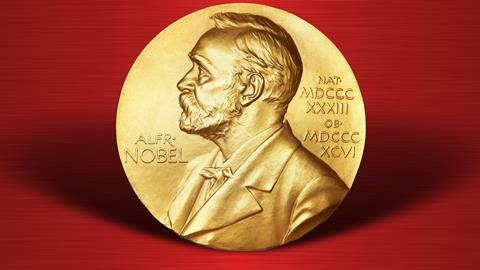 The winners of the chemistry Nobel prize in chemistry will be announced on Wednesday 3 October, with the physiology or medicine prize on Monday and physics on Tuesday. What is 'checkpoint therapy' and why did it win the medicine Nobel prize?